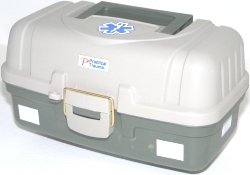 The 142 piece Basic First Aid Kit in a hard plastic box is designed for use in the home, office or auto. This kit contains specific supplies you'll need outside the home including a CPR barrier and a survival blanket to keep a patient warm. This is an excellent kit to keep in your car. The box is 14 W x 7 H x 8 D.
The Basic First Aid Kit should take care of the small stuff, moderate injuries and even a real nasty one if necessary.